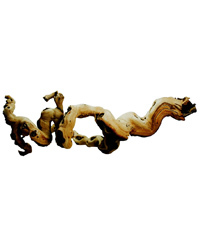 Lucky Reptile Premium Grapevine is a heavy and dark wood decoration which your reptile will love to climb under and hide behind. The wood is sandblasted to give a good quality finish. Grapevine makes an excellent addition for reptile vivariums and terrariums due to its many branches providing hiding places and climbing opportunities.